Some time ago I saw a documentary on experts. I've been thinking about something the documentary marker pointed out ever since. Experts are supposed to say "always" and "never". I don't do that, so I've taken to pointing it out to students when I teach and explaining why. Knitters create fabric in very different ways. We create the stitches by holding the yarn in different hands, some of us are throwers, some are pickers. We tension the yarn with various methods. What one knitter finds difficult another finds easy. We have highly idiosyncratic preferences in needle materials and types. I can teach a knitter three ways to do something and occasionally I hear a little "ahhh" sound. When I hear that I know that one method, for whatever reason, speaks to the individual knitter. I don't know why! I just know it does! If I ask, most knitters can't explain it either. Look at the photo below. 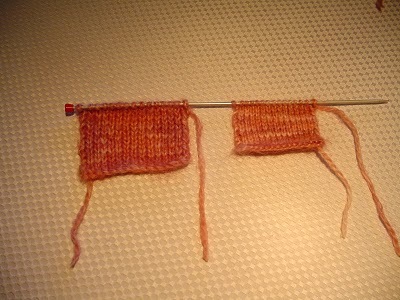 Two swatches, same yarn, same needles, same number of stitches, same number of rows, different knitters. "Always" and "never" rules would restrict each one from achieving a great result in the finished product. These could also be done by the same knitter on different days. I find that my needle choice (steel, wood, or plastic) and the relative stiffness or limberness of my hands greatly affect my tension on any given day.